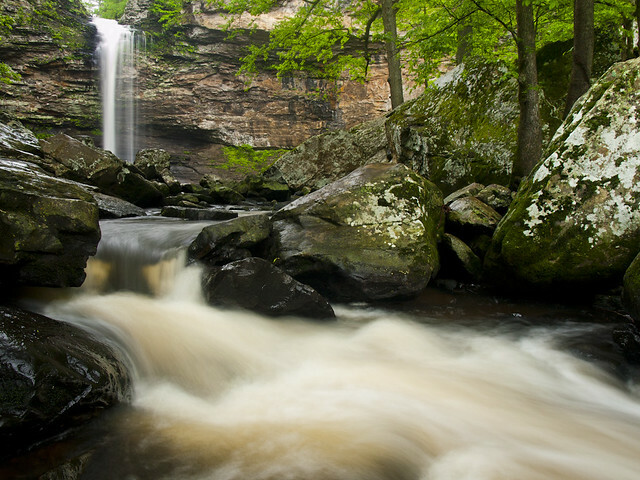 After visiting Petit Jean on Friday, I headed north into the Ozark National Forest to meet up with a bunch of other photographers during the Arkansas Nature Photographer's Spring Gathering. The past two years, we camped at the Fairview campground along Hwy. 7 for the gathering. Which is a nice enough place to camp, when it's not pouring down rain and about 40 degrees outside (like the previous two years). But this year, we upgraded and stayed in a spot that was luxurious by comparison. One of the members of the group has a cabin, and she kindly agreed to let us stay there for the weekend. So before dawn on Saturday, we loaded up and headed to the trail that leads down to the Blue Hole. 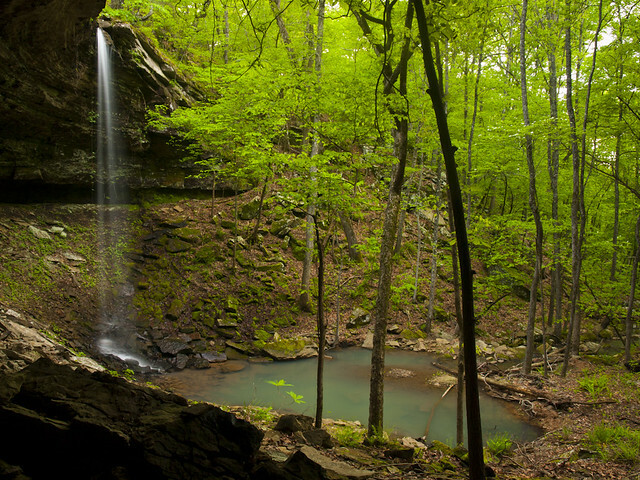 The hike is rated as a 4-mile difficult bushwhack. Is it all that bad? Well the first part is actually pretty easy. 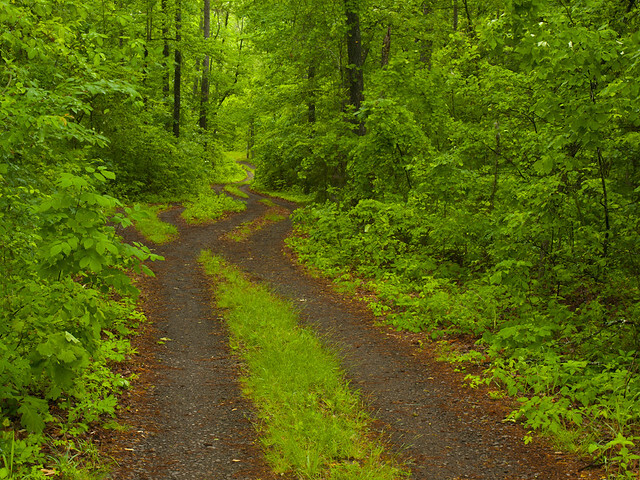 You just have to walk along an old road, and then bushwhack into the woods. But the road is on the top of a steep hill, and the Blue Hole is far below at the bottom. Most of the hike is spent either sliding down the hill, or slowly slogging back up to the top. It's not fun. 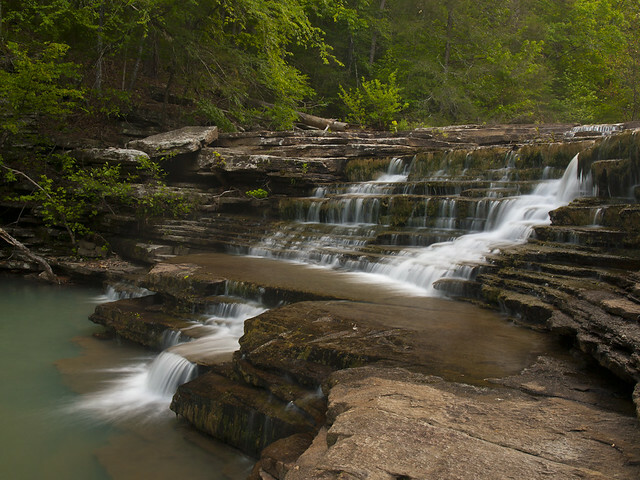 There are a few nice waterfalls and cascades that are located all fairly close to each other. 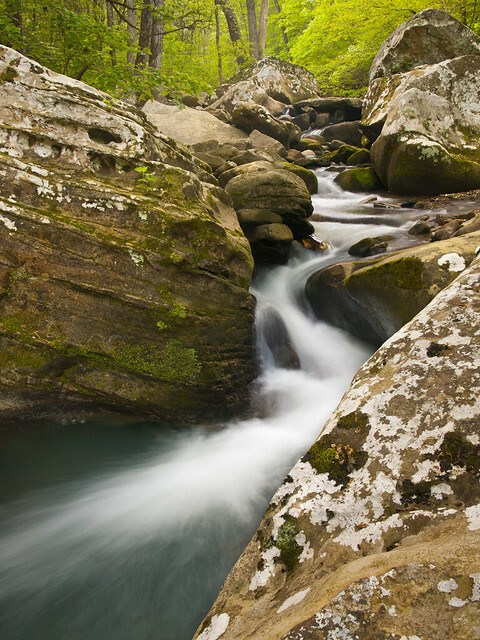 A larger waterfall was just around the bend, along another stream that flows into Hurricane Creek. 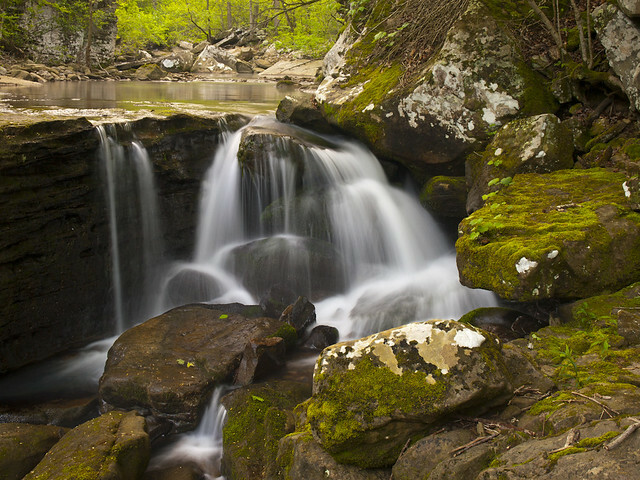 It's a really neat waterfall - when there is more water the falls stretch across the entire width of the creek. The sun was about to rise, beginning to cast the forest with a yellowish tint. 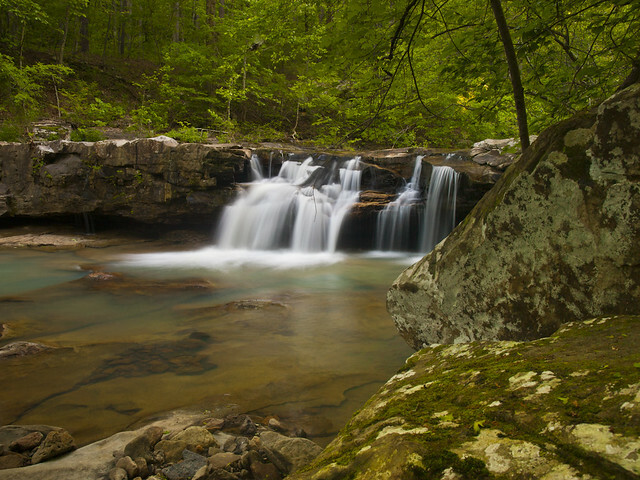 There is another waterfall located further downstream on Hurricane Creek, so I hurried to get there before the sun came out. It was another nice waterfall that had a lot of personality. 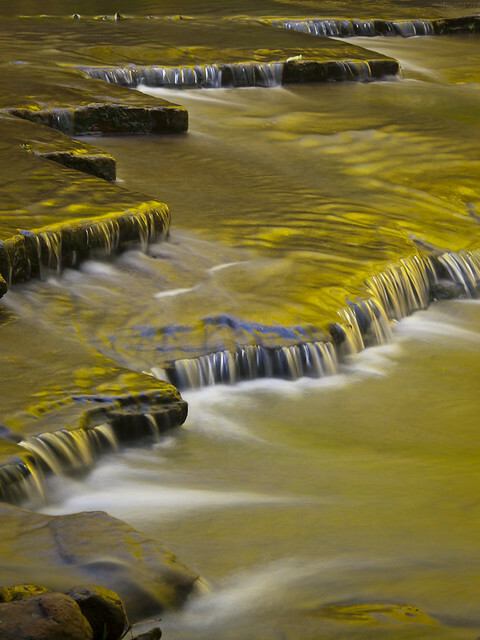 I got really interested in the way the rocks at the base of the falls had been sculpted by the water. And eventually, the sun did come up. So it was about time to head back to the car. Since that meant having to head up the side of Mt. Everest, I was eager to take my time heading out. So we went back by one of the other cascades, which just happened to be reflecting some awesome golden light from the sun. But then it was time to head on up the hill, and slowly but surely we all made it to the top. 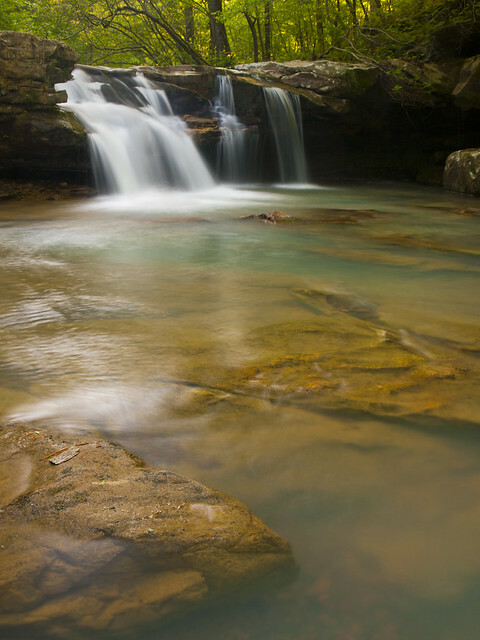 With the sun out, any chances of getting waterfall pictures were dashed. But it did mean that I could go back to the cabin and take a nap. The past two APN gatherings, I had managed to somehow catch a shoe on fire. In 2010, it was from leaving my hiking shoes to dry by the campfire, where a log rolled over and attacked them. The tops were melted and burned. And last year, an ember from the fire drifted out and landed, kamikaze-like, on one of the shoes. So there was a nice little hole caused by the burn. But on Sunday, when I left the cabin, I was happy that I somehow managed to survive the weekend with all of my shoes intact. It wasn't until I got on the freeway, about an hour later, when I had a sudden realization. In a genius move on my part, I managed to drive off and leave the shoes behind. Whoops. It was cool, cloudy and rainy last Friday. Which translates to perfect photography conditions. And luckily enough, I had taken a vacation day and was actually able to enjoy it. 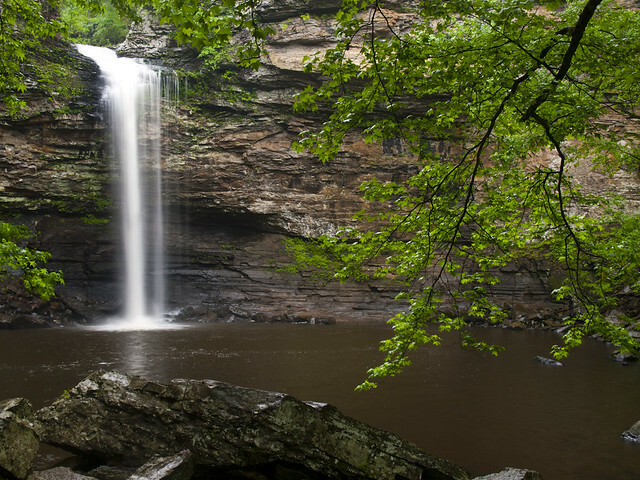 So that afternoon, I headed out towards Petit Jean Mountain. I wanted to get a picture of a waterfall, but this Spring has been a bit on the dry side. 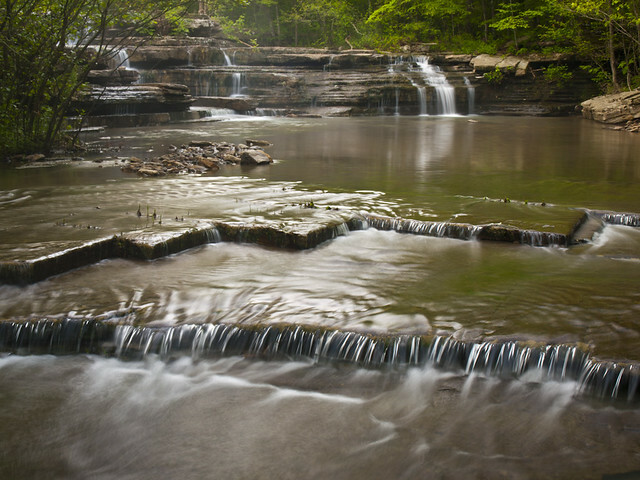 So I decided to hit one of the most powerful waterfalls in the state - Cedar Falls. 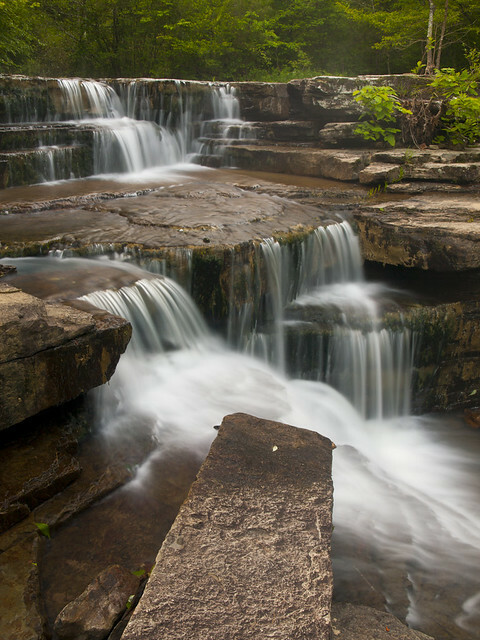 Even if there has been a lack of rain lately, the falls here should at least have a decent flow. Plus it had actually been a few years since I'd hiked there, so it was time for a return visit. It was lightly raining when I found the temporary parking for the Cedar Falls trail (the lodge at Petit Jean is being renovated, so things have been moved around some). I started down the trail, past the steep switchbacks on the hill leading down to the creek. 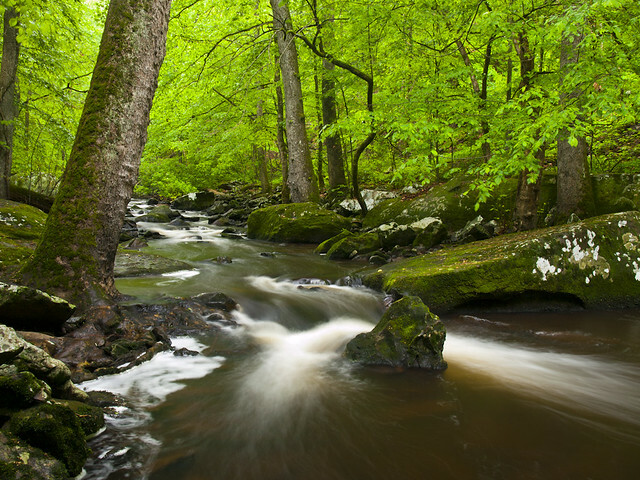 This is easily one of the most popular trails in the state. 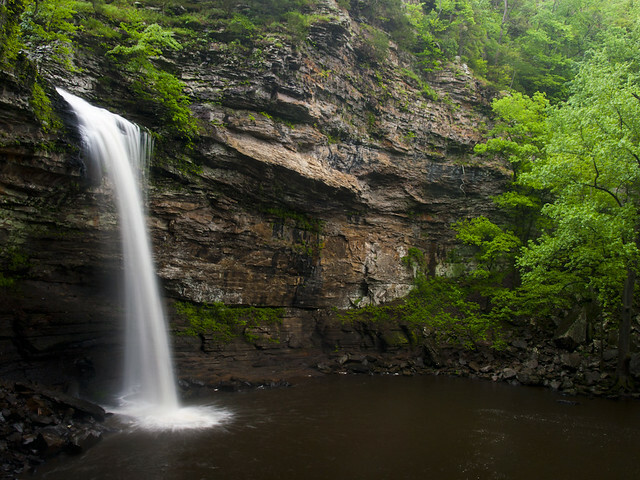 The falls, at 95 feet tall, are a truly impressive sight. Usually there are tons of people here, so I was a bit surprised to find not a single other person there. 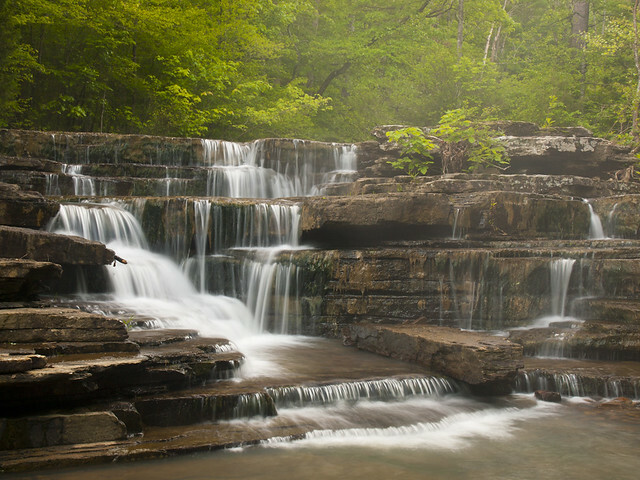 It's rare to visit these falls and have them all to yourself. Decided to head out to take pictures after work last Wednesday, and ended up wandering around town trying to find something interesting to point the camera at. I eventually ended up at the old North Little Rock High School Building, which I'm a bit familiar with. I graduated from there awhile back (actually 15 years ago, yikes). 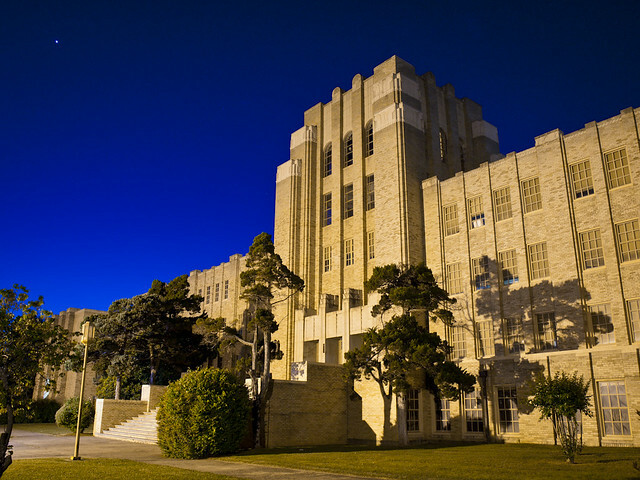 NLRHS - West Campus (or Ole Main) was first opened back in 1929 and cost a total of $750,000. The building is an "outstanding example of the 'zigzag moderne' trend of the Art Deco style of architecture. Featuring a massive, centrally placed tower of a ziggurat configuration and adorned with geometric-patterned ornament, the building exemplifies the design characteristics of the then-fashionable Art Deco style." The tower was long-ago closed off to students, but it does have one resident. Apparently a ghost of a student, who died in the 1950s, is said to haunt the tower and the stage. But I stood on the grounds for about 20 minutes taking pictures of the old building, and never saw any ghostly spirits lurking about. After spending time with the family in Charleston on Easter Sunday, I decided to visit a nearby waterfall on the drive back home. 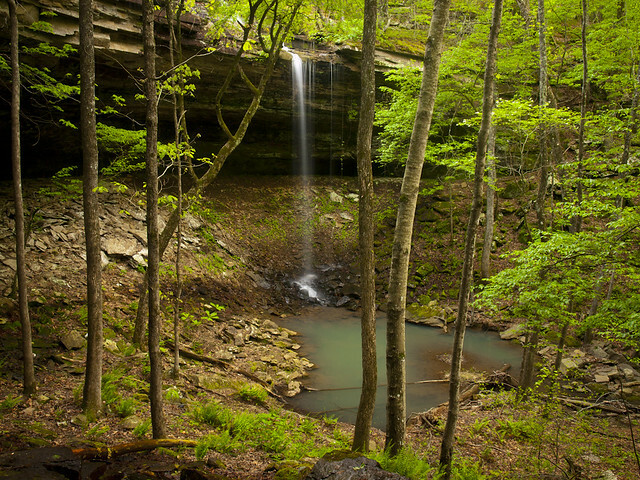 The waterfall was Bingham Hollow Falls, in the Ozark Mountains. 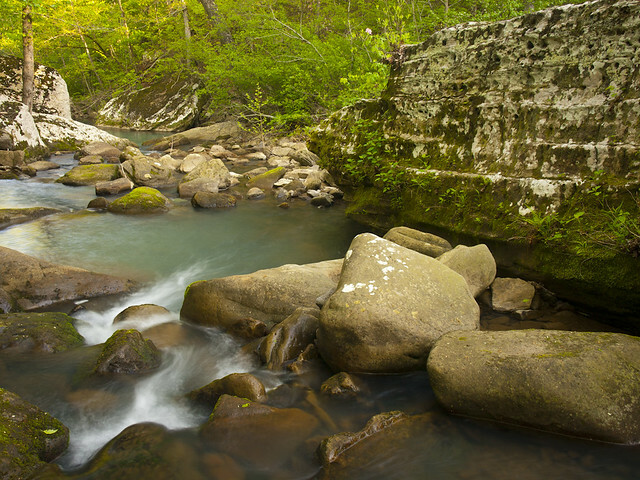 To get there, you drive north from the town of Ozark into the Ozark National Forest. 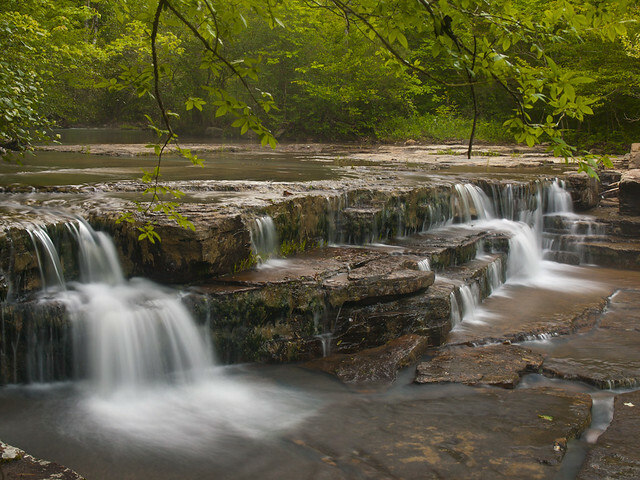 Did I mention that this waterfall is in the Ozarks? It is a pretty cool waterfall. It's been measured at 51 feet, and there is a neat overhanging bluff under the falls. I'm definitely going to have to check this place out again. It's a very cool waterfall that's very easy to reach. 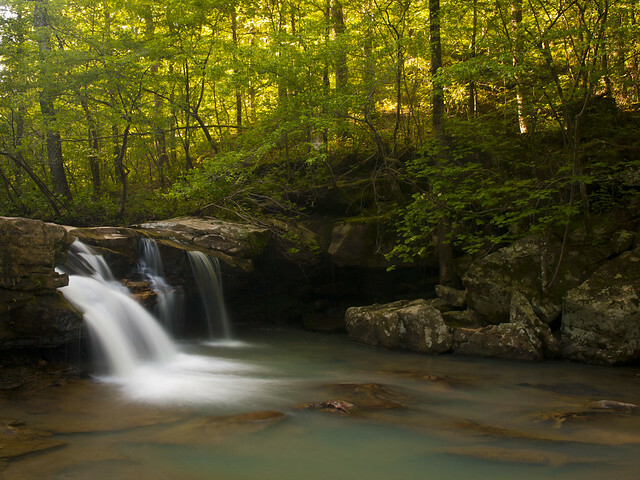 Last weekend I met Matt in Conway and we drove up into the Ozarks to explore a scenic area in the Ozark National Forest. The area was around a place called Big Creek. Now the creek there wasn't all that big, but there was some neat places to explore. After turning off Hwy. 7, we drove down a dirt road and eventually set up camp next to the dirt road that leads into the Big Creek area. This has so far been an unusually warm Spring in Arkansas. But it turned out to be a chilly night. Up in the hills, the temperature dropped down into the low 40s. And at 6am on Saturday morning, we woke up in the cold and began to make our way toward Big Creek. I'm not usually a fan of being awake at insane times like 6am, but I made a sacrifice that day because it looked like it would be a sunny day. The plan was to hike to the waterfalls there, and have enough time to take pictures of the creek before the sun came out. After hiking about a mile, we hit the first of many scenic spots. 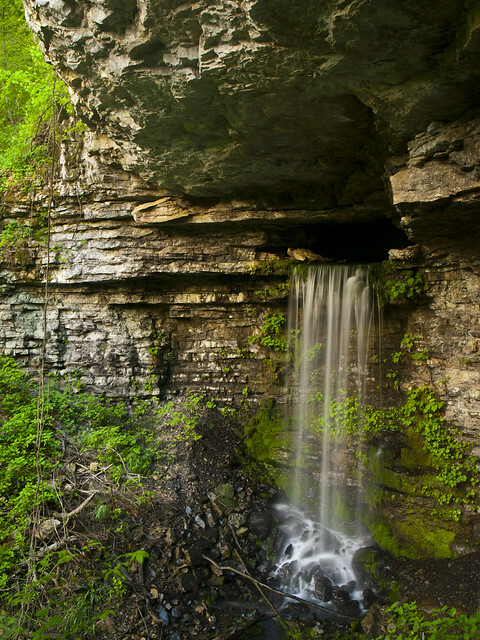 A spring was flowing out through a cave in the bluff, dropping through several cascades that were surrounded by thick moss. 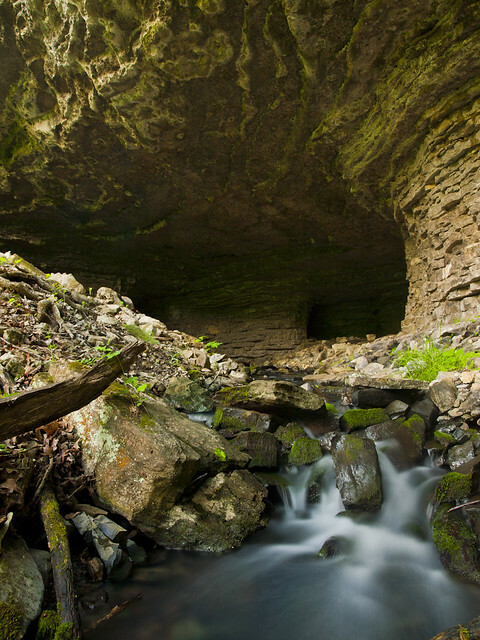 Just around the bend is a 29 foot-tall waterfall that drops out of a small cave. It was a very neat place. Especially since the cave is spring-fed. So even though we haven't had much rain lately, there was a nice amount of water in the falls. From there we hiked down to the creek. You can definitely tell that it's Spring now. It seemed like the entire floor of the woods was coated in a thick layer of poison ivy. I'm amazed that as I write this a few days after our visit, that I'm not covered in a rash from the poison ivy. I mean we pretty much slogged through a jungle of the stuff. If you could somehow turn poison ivy into gasoline, and therefore make it into a cash crop, then Arkansas would be as rich as Qatar. The creek also had some nice small waterfalls on it. So we hurried to get a few pictures of it before the sun came up. The sun was just about to bust onto the shot, so we took a few last pictures of the creek before heading back to camp. After breaking camp, we drove down the bumpy and dusty dirt road and eventually met back up with Hwy. 7. We drove north to Jasper and had just enough time to get breakfast at the Ozark Cafe. I had the pancakes, and they were delicious.